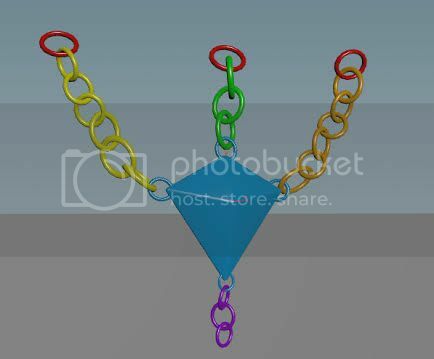 Hi everyone, I have this hand-modeled chain/gem pieces as an alembic file, with the top red parts moving (deforming, not transforming), I need to simulate the rest. Reference image: http://i111.photobucket.com/albums/n157/fabriciochamon/unnamed.jpg (sorry, I can't embed images on the list) Now If I set these red objects as static rbds, I got everything working (Bullet solver), my substeps are high enough so that the chain doesn't break and the simulation is stable. I'm also working in cm, the object is about 8-10cm wide. as soon as I turn them into deforming rbds, they do not collide anymore (passing through other objects), and the whole object falls. The movement is not super fast (each circle moves about its bounding box size in distance at each frame). It kind of pops and displaces the rest of the objects before passing through, so it seems to contribute to the simulation..My first response to that was to increase substeps. But then I can go as high as I want in either Bullet or DOP networks substeps and it still goes through. I tried creating the rbds as *Deform Object* (Collisions tab), tunning collision source to a dense volume and setting geometry representation to concave, no success. Also tried creating packed/unpacked rbd sphere objects (Rigid Bodies tab), collision representation set to convex hull and *create hull per set of connected primitives* checked. Initial object type set to *create deforming static objects. * Finally tried creating a RBD hero object, collision representation set to concave, *use deforming geometry* checked.. I tried everything, you name it haha.... the geometry simply ignores collision no matter what. Should I go with the Houdini solver instead of bullet ? What is the most reliable way of handling deforming object collisions ? Thanks for any advice!